The leaves are falling, the temperature is dropping, the husband is glued to a football game. And that means, it’s time to pull out your large dutch oven (go ahead and laugh about dutch oven… I’ll be waiting. In fact, the only reason I’m writing this post is so I could use the word dutch oven. Okay, done?) and make a big pot of hearty chili. I’ve been making chili since I first got married, almost 11 years ago. And why not? It’s easy, filling, fast to assemble, and you can eat the leftovers for several days afterwards. So, when the husband asks what I think to be one of the worst questions in the world, “What’s for dinner?”, you can say “Chili! Again! 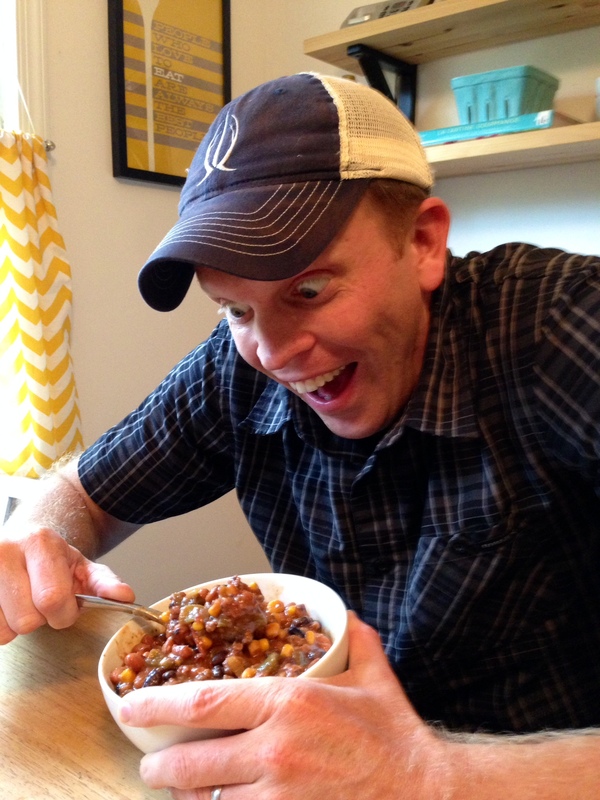 For the fourth night in a row!” And if you’re going to be eating that much chili, it better be good chili! Here’s a picture of Taylor the Husband during our first year married. 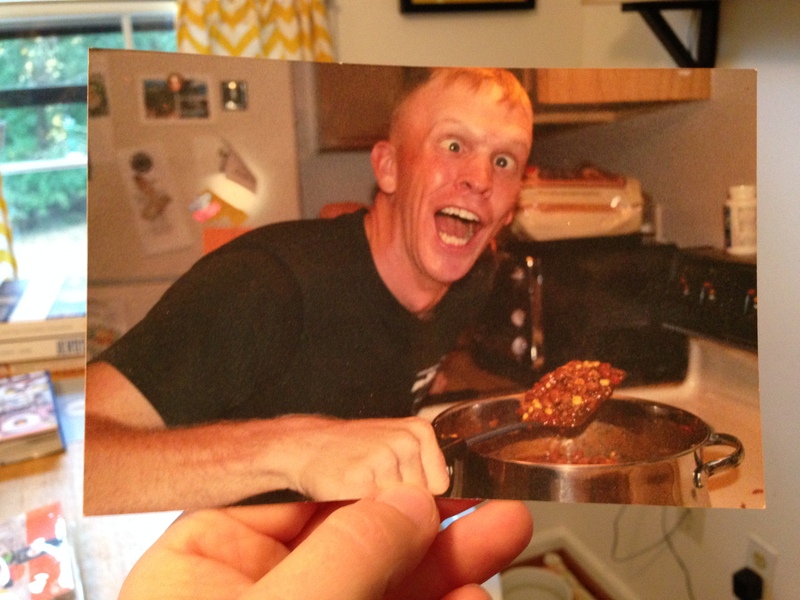 He is obviously super excited about the chili on the stove top. Isn’t he so lovable? I got my original recipe from my father-in-law, and it has since evolved into it’s own being. This is the basic recipe. 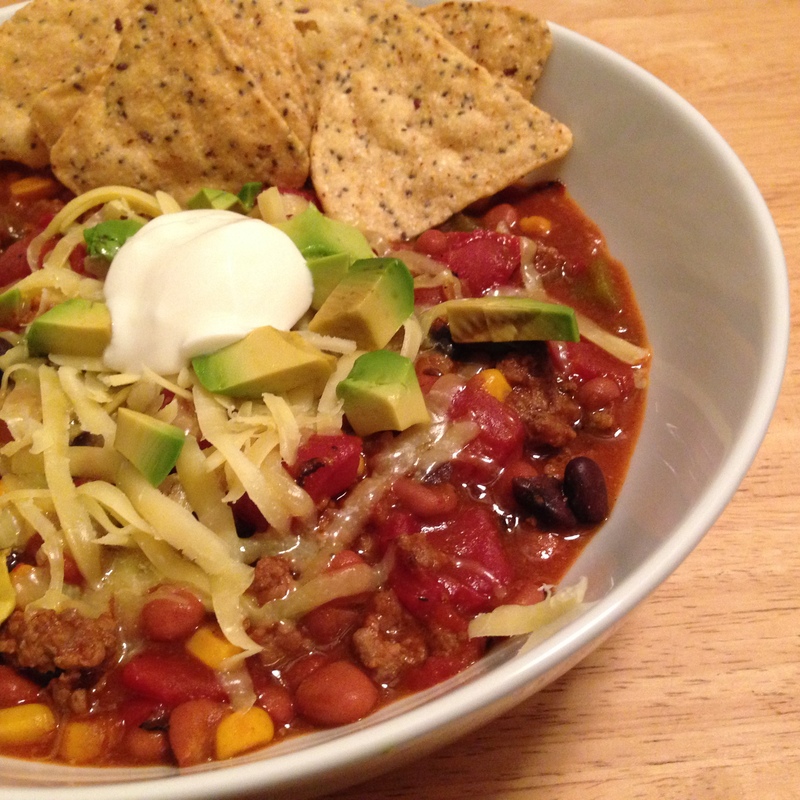 Almost every time I make chili, it is some variation of this recipe. For example, I may fry up some slices of bacon and use the drippings to cook my vegetables in, reserving the bacon to garnish the chili. I may use different beans depending on what’s in my pantry. I have many times used a bottle of marinara sauce in place of the diced tomatoes, and it turns out brilliant. You can make it spicier or not spicy at all. Whatever makes your tail wag. And try to go for nice happy grass-fed meats and organic veg and beans. 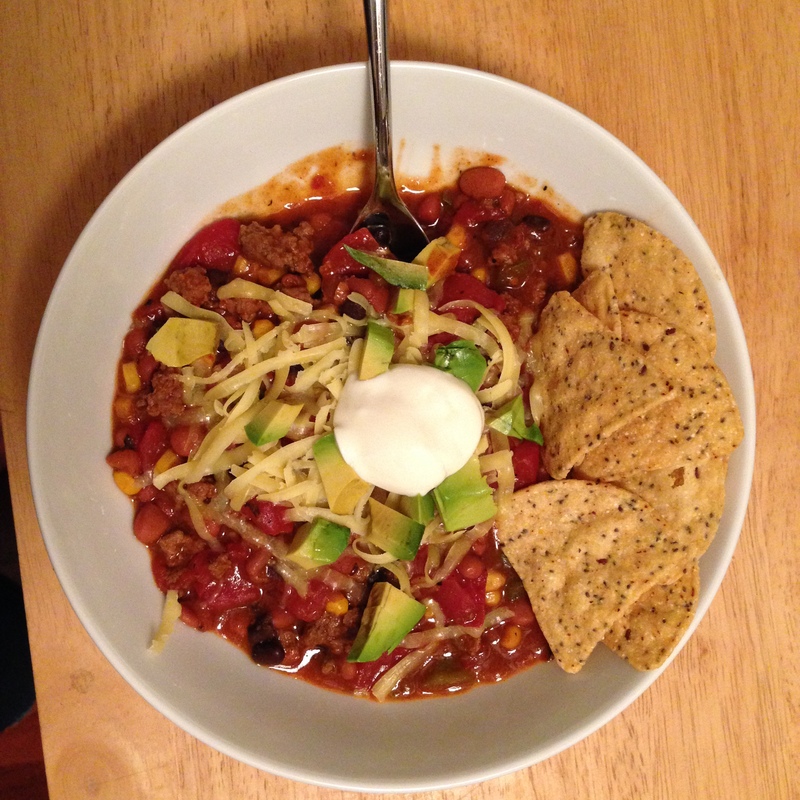 So have fun, make it your own, and don’t let your significant other dutch oven you after eating your chili! 1 or 2 15 oz. cans black beans (you could also use kidney beans too), drained and rinsed. Heat olive oil over medium heat in your dutch oven or large soup pot. Add onion and pepper and add a pinch of salt. Cook for 5 minutes until softened. Add diced jalapeno and cook for another 2 minutes. Crumble ground beef into the vegetables and brown. Season with salt and pepper. Let the meat get a nice brown color- this means flavor. 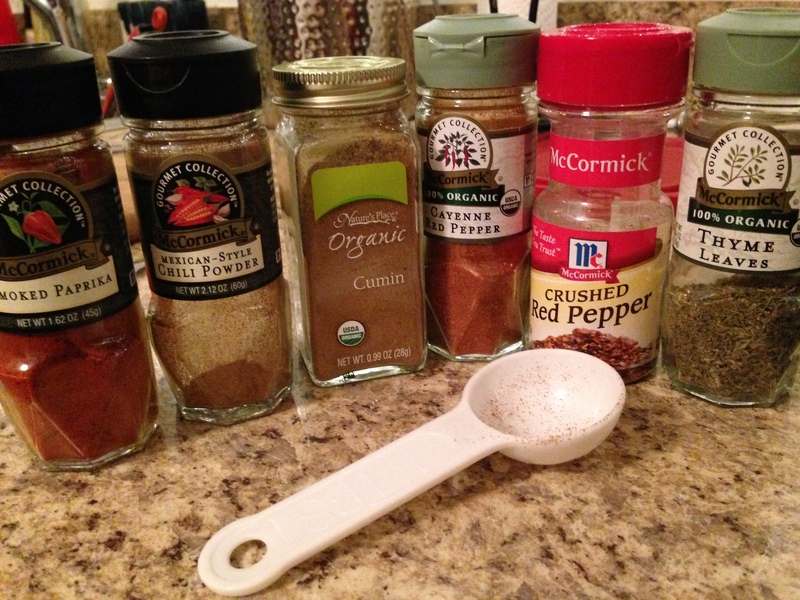 Now mix in all the spices and let the spices warm and develop flavor for 2 minutes. Add the tomatoes, beans, corn, and beer. 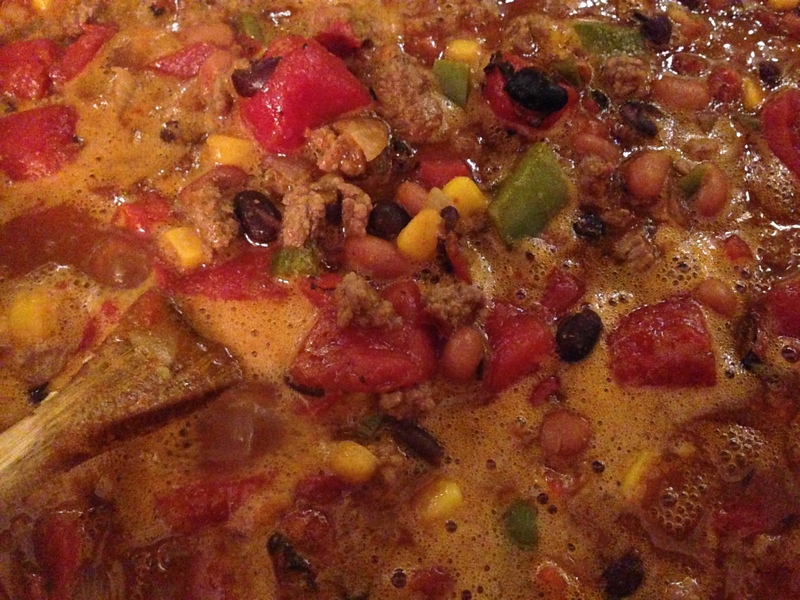 Bring the chili to a simmer and continue to simmer for at least an hour. Garnish with whatever you please and enjoy! The chili is done when it’s thickened and turned a rich red color. And look, Taylor the Husband still likes it after 11 years!